The Owl Nebula, Messier 108 galaxy, some more distant galaxies, active galactic nuclei, and even quasars are seen in this picture. 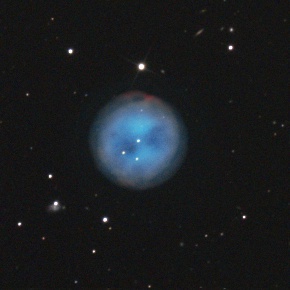 The Owl Nebula (Messier 97 or NGC 3587) is one of the faintest Messier object in the sky. It is a planetary nebula in the direction of Big Dipper (Ursa Major). 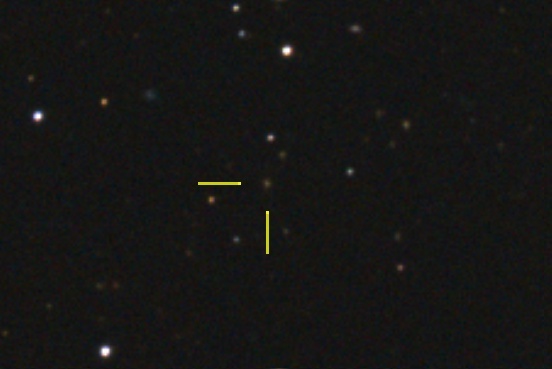 Its total brightness is 9.9 magnitude, which makes the object difficult to observe in light polluted skies. It was discovered by Pierre Méchain in 1781. The name of the nebula comes from its appearance, with the two dimmer spots being the eyes, it resembles the head of an owl. Its appearance is assumed that a cylindrical torus shell is viewed at an angle, the ends of it with less matter look as the eyes. Thought to be one of the most complex planetary nebulae. Its distance is quiet uncertain. The most widely accepted value is 2600 light years from Earth. The mass of the nebula is approximated as 0.15 solar masses, while the central star is about 0.7 solar masses. 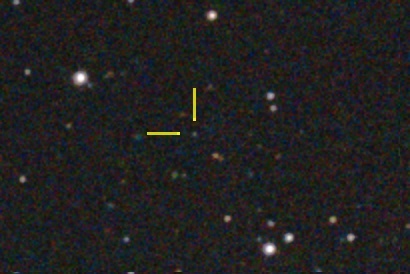 The faint central star's brightness is 16 magnitude. According to its expansion speed, the nebula is thought to started forming about 6000 years ago when the central star ejected its atmosphere in its red giant phase. 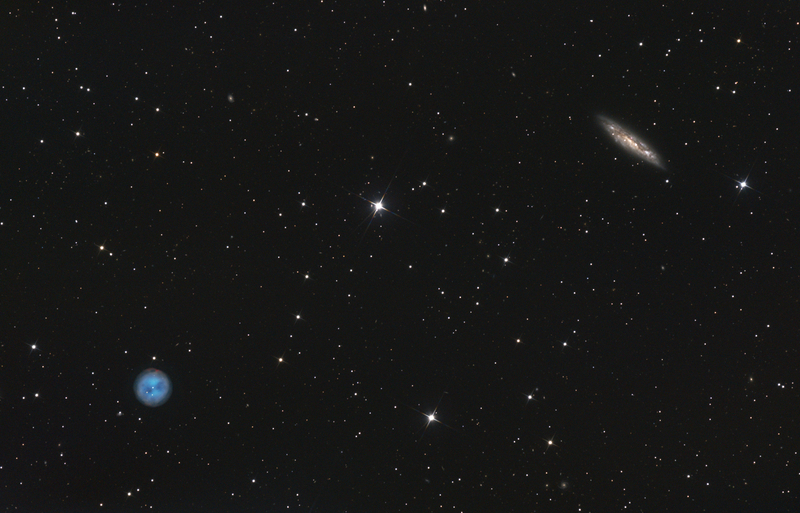 Several faint backgroud galaxies can be spotted around M97, one of them (bottom-left to the nebula) seems to be almost in the same direction as a bright star. Faint distant galaxies can be spotted in other parts of the picture as well, some of them are shown below enlarged. 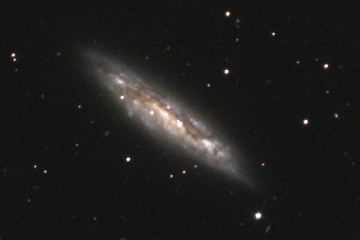 Messier 108 (also known as NGC 3556) is the other prominent object in the picture. A barred spiral galaxy 46 million lightyears from Earth, seen almost from its edge. 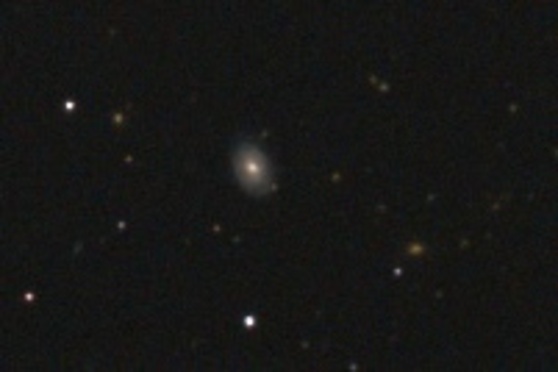 Although it was discovered by Pierre Méchain in 1781, it wasn't added to Messier's catalogue until 1953, when Owen Gingerich decided to add M108 and M109 to the list, after studying Messier's life. The mass of the galaxy is about 125 billion solar masses and contains about 290 globular clusters. X-Ray observations revelaed signs of a supermassive black hole in the core of the galaxy, however no intense activity (like in case of active galactic nuclei) was detected by later examinations. Distribution of neutral hydrogen within the galaxy shows shells of expanding gas, expanding for thousands of lightyears, these shells are called H1 supershells. The energy source of this expansion might be intense star formation and supernova explosions in the galaxy, or matter falling in the glaxy from the close neighbourhood of the galaxy, or radio jets. 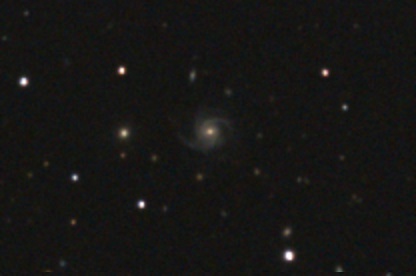 A type II supernova was observed in M108 in 1969 (SN1969B). A galaxy with active galactic nucleus.